Sonic 3 is never a bad pick for a 20 Games Art Challenge! Just this week the sad news hit the Internet that the episodic Sonic the Hedgehog 4 won’t get its final episode 3 ..and that after Sega released a really mediocre Sonic Boom for the Nintendo WiiU a few months ago. Not the brightest time for Sonic fans. Personally, the classic 2D Sonic the Hedgehog games are still my favourite of them all and Buster Garou included Sonic the Hedgehog 3 in his “Draw 20 of your favourite video games” challenge and gave it the 13th Spot. I thought his style is mostly fitting for rather dark and gritty characters, he drew one of the darkest images for our Street Fighter Tribute back in 2012 as example with his take on Evil Ryu. 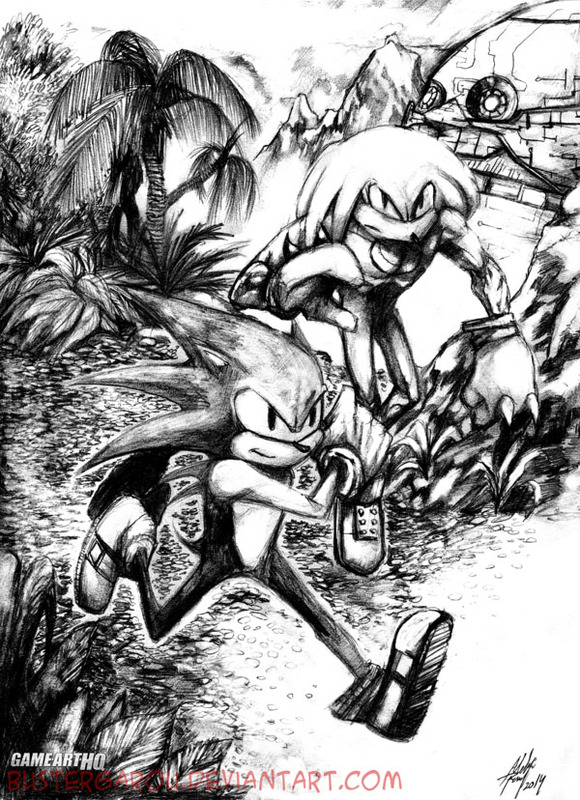 With this Sonic fan art he is totally showing that he can draw more colorful characters and games as well though. Awesome work @ Buster Garou and a Happy New Year to you!